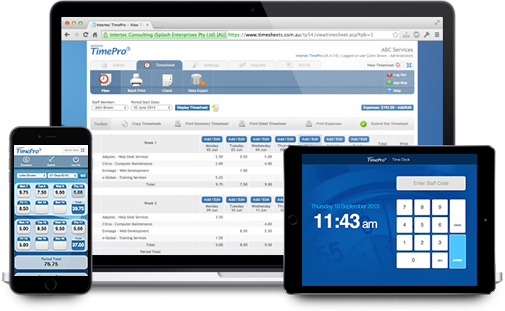 Intertec TimePro is an affordable, proven and easy-to-use web timesheet solution that facilitates time tracking via the Internet or your Intranet. With our fully hosted (Cloud) option, you have no expensive infrastructure, installation, setup or maintenance costs. You can be up and running with your new timesheet system in no time at all. Alternatively, we have an In-House version available to install on your own web server. This is ideal for clients with infrastructure in place who like to have greater control over the application. Our web-based application supports multiple interfaces allowing you to seamlessly record, track and manage time and expense records via your desktop computer, tablet or smartphone. In addition to our standard application interface, we have recently launched a Time Clock interface for tablet devices. This is ideal as a modern replacement for traditional clock on / clock off time capture devices. Our optional accounting modules provide integration with ‘best-of-breed’ accounting software systems including MYOB, QuickBooks and Xero. The accounting integration module makes it a breeze to create your sales invoices, purchases invoices and payroll records. Generate Project, Staff, Task and Expense reports with ease from our comprehensive Reporting module. Provide your Managers with access to filtered reports relevant to their needs. Use the powerful Drill Down feature available on every screen to quickly report on the underlying data behind any figures displayed. Use our Data Export module to build, save and run custom exports and output the data to your favourite spreadsheet program. We have highly skilled and dedicated professional support staff to ensure your implementation and ongoing support needs are met to the highest standards – you won’t be talking to any call centre with us. Our consultants will guide you through the setup process and ensure that the application is configured to best meet your business requirements and thereafter promptly assist you with any queries you may have. Easy time-tracking - Intertec TimePro web timesheet is easy to use and allows fast entry, no matter where your staff are located. No staff training is required. Manage projects and resources – manage and track timesheets, project costs, rates and resources from anywhere using your computer, tablet or smartphone. Save administration time – chase timesheets with a single click, export data to other business systems, run comprehensive reports and more. On the road or onsite? Your mobile workforce can access Intertec TimePro via mobile devices such as tablets and smartphones through our Compact Interface. Queensland Government GITC Accredited Supplier – ref Q-4774.